CHAUVET have announced the release of PiXPar 24 and PiXPar - two must-have pixel mapping fixtures for mobile DJs or club installers looking for high-impact visuals. PiXPar 24 and PiXPar 12 are PAR can-style wash lights powered by individually controllable, tri-colored LEDs to create custom animations and video effects. Perfect for events being filmed or venues that use video or pixel mapping as part of their display, high-powered LEDs nearly eliminate multicolored shadows while high-frequency LED dimming allows for flicker-free video operation. These powerful fixtures are ideal for use on stage, in the studio, installed in a nightclub and numerous other applications. Great for use as a standard PAR, both fixtures project a saturated wash and include dimming curves for smooth LED fading. Silent operation with non-moving parts makes them ideal for installations requiring quiet fixtures. PiXPar 24 and PiXPar 12 include built-in programs and multiple DMX personalities to fit a wide variety of programming styles. Automated, pre-built programs are accessible with or without DMX control for simple operation. For complete control, both fixtures are compatible with all major pixel-mapping programs, including ShowXpress with pixel control, to easily generate and manage intricate light shows using your computer or smartphone. Onboard three- and five-pin DMX connectors increase control options and a locking IEC power input ensures the power cord is always secure. 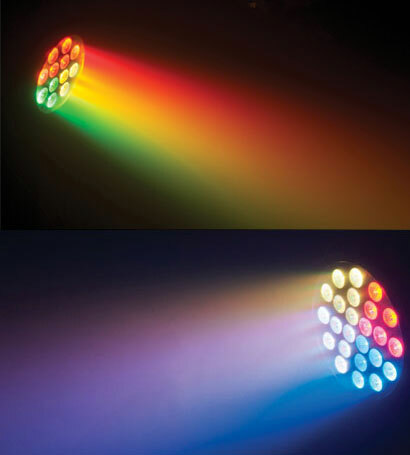 Powered by 24, three-watt tri-colored LEDs, PiXPar 24 PiX is a durable, full-size PAR can that weighs less than 5.5kgs. Powered by 12, three-watt tri-colored LEDs, PiXPar 12 is half the size of PiXPar 24 and weighs less than 3kgs.